Organic growing - for better or worse? Buying organically-grown fruit and vegetables has been marketed over recent years as being better for both you and the planet, but research is beginning to show that it is either level with conventional growing or, in some cases, actually worse. So, is it just a scam for retailers to hike the price or is there actually a benefit? One huge issue is the lack of standardisation when it comes to what is called “organic”. Some countries are happy to certify the name if the use of artificial fertiliser and chemicals has been reduced, others insist that only natural fertilisers like manure and compost are used, and no artificial chemicals. This classification is again misleading, because it depends what went into the manure and some of the so-called “natural” chemicals are non-selective, so they kill every insect they come in contact with, including bees and other beneficial pollinators. It’s worth noting that many of the “artificial” chemicals on sale in the UK are actually based on plant extracts, fish or mineral oils and all are rigorously tested for safety before being certified for use. Gardeners who class themselves as organic in the UK will usually avoid using any chemical at all, but will happily splash around a material as toxic to plants as washing up liquid. Considering this is designed to strip grease from your plates, just consider what it does to the natural outer waxy coating of the plant leaf. Years ago, gardeners would use “soft” or horticultural soap against aphids, but this was a very different product and using washing up liquid today is likely to cause scorch and die-back. Research at the Chalmers University of Technology in Sweden has found that growing organically on a large scale uses more land than growing conventionally, because the crop yield is lower, due to less fertiliser being used. In addition, more of the crop has to be grown as there is an increased loss to pest and disease attack. Peas grown organically in Sweden had up to a 50% greater impact on the climate than conventional ones and winter wheat was worse, at 70%. This was because the need for extra land involved felling areas of trees which were mopping up pollutants and carbon dioxide and giving off oxygen. When tested, organically-grown fruit and vegetables vary little from conventional ones in terms of chemical residue content, but they usually contain higher levels of anti-oxidants, the plant’s natural defence against pest attack. The conclusion is that, overall, there is more to be gained from eating increased quantities of fruit and veg than how they are grown. Your best bet is still to grow your own, so you can eat the harvest fresh from the garden while they are still packed with nutrients and have the best flavour. There are no food miles involved and you have full control over what goes into them. 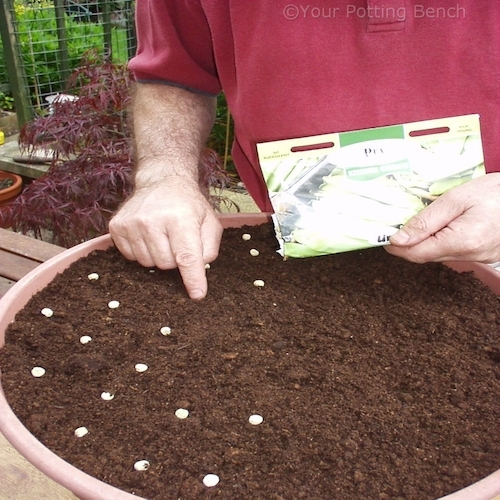 So, why not have a go - try a packet of peas this year, sown into a pot. Sow them thickly so you can harvest half of them early, as tender shoot tips to eat raw in a sandwich or salad, then leave the rest to grow and produce tasty peas in the summer. It’s the easiest way to start, simply use fresh multi-purpose compost and remember to water them regularly. Who knows where it will lead…..